This disc was auctioned on eBay in 2004.
that the disc originates from 1968, I would suspect that it was cut in 1963 and EMI simply still had it in 1968. This is the master compilation reel. On offer here is a very rare 1968 UK MONO ACETATE (especially in this condition!!!!) by The Beatles called 'With The Beatles' and is a MONO UK pressing!!!! It is also VERY likely that this acetate is 100% UNIQUE!!!! The acetate contains the COMPLETE LP of 'With The Beatles'!!!! PLEASE READ THIS DESCRIPTION CAREFULLY - THIS SURELY HAS TO BE ONE OF THE RAREST AND MOST IMPORTANT BEATLES FINDS OF THE YEAR!!!! THIS ACETATE IS OF THE UTMOST RARITY AND MUST BE HUGELY VALUABLE!!!! THIS ACETATE IS SIMPLY AWESOME!!!! THIS IS HAS TO BE REGARDED AS ONE OF THE RAREST BEATLES ITEMS EVER TO BE PUT UP FOR SALE!!!! THIS IS A 100% GUARANTEED GENIUNE 1968 BEATLES ACETATE OF 'WITH THE BEATLES' LP!!!! NOT ONLY THIS BUT I KNOW THE FULL HISTORY OF THE ACETATE!!!! I WILL EXPLAIN IN DETAIL THE HISTORY OF THIS MASSIVELY RARE ITEM!!!! I was informed of the history of this MEGA rare item by the previous owner. The previous owner was a employee working at EMI Records and was given this acetate on her leaving of the company in late 1968. She had always liked the Beatles and when she left she asked for something by the Beatles - and she was given this LP acetate. This story is of course backed up by the fact that this acetate is MONO (so it is obviously late 1960s or earlier), and also stamped in the centre of the acetate it says 'Transco' who were the makers of 1960s blank acetates for many of the major Record Companies - including EMI. Not only that but stamped below the centre hole the acetate has the date of manufacture '4 9 68'(see Picture)!!!! THIS IS A MASSIVELY RARE 100% GENIUNE 1968 'WITH THE BEATLES' ACETATE!!!!! DONT MISS THIS!!!! HOWEVER - what makes this acetate even MORE interesting is that what it was pressed for!!!! 'With The Beatles' was originally released in 1963 - so clearly there must have been a special reason for cutting this acetate in 1968!!!! Acetates were usually used as listening discs - to check a mix change, or to check the quality of an original recording. So this MEGA RARE acetate must have been cut in 1968 for a special reason!!!! I have played this acetate through VERY carefully just once (on the lightest possible weight setting), and I did actually notice two differences to standard MONO pressings. Firstly the treble and bass settings are totally different to the standard MONO pressings - but more importantly at the end of the track 'Please Mr Postman' - instead of fading out normally the song just abruptly ends!!!! I am also pretty certain that there may well be other subtle mix changes in places - but these could be difficult to spot - and I certainly dont want to play this acetate more than once!!!! But it is seems pretty obvious to me that an LP originally released in 1963 would not have had an acetate cut in 1968 unless it was for a special reason!!!! I have already found 2 differences I mentioned above - and that was only from the first play!!!! There could well be many more!!!! Not only that - but I very much doubt if EMI were in the habit of wasting money and they surely wouldnt have cut a MONO acetate in 1968 (when Mono was on the verge of being phased out) without good reason!!!! This is an ORIGINAL MONO UK 1968 acetate and is in STUNNING condition!!!! All the tracks are Pure quality Beatles at their best!!!! Any fan of The Beatles, or 60s music in general, will want to have this in their collection!!!! The acetate is in SUPERB condition compared to most that you see!!!! Often any rare acetates that turn up are usually in terrible condition - BUT THIS ONE IS NOT!!!! The acetate retains ALL of its shine and gloss and has NO scratches, NO hairlines, only a few light NON sounding scufflines and only some VERY light paper scuffing only visible under light!!!! ITS AS SIMPLE AS THAT!!!! THE ACETATE STILL RETAINS ITS ORIGINAL 'JUST PRESSED' LOOK!!!! It is great to find that the playing of the acetate is as STUNNING as the visual!!!! It plays STUNNINGLY with NO pops, NO sticking, NO jumps, and barely ANY crackle AT ALL (quite rare on an acetate)!!!! The acetate must grade Very Good+ if not better (a VERY rare and HIGH grade for an acetate)!!!! Believe me this acetate is NOT overgraded in ANY way!!!! I use STRICT RC grading standards - it is not in my interest not to!!!! Brillant!!!! The acetate also comes in its ORIGINAL 'Transco' Acetate sleeve. 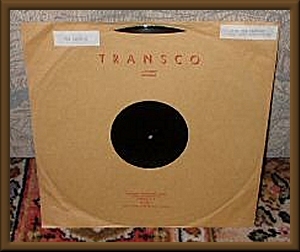 Transco were the manufacturers of recording blanks (otherwise known as acetates) for most of the major record companies. The sleeve is in STUNNING condition with NO splits, NO staining, NO tears, and only some slight creasing!!!! It is VERY rare to find original sleeves for acetates!!!! The cover also has typewriters labels on the front which say 'The Beatles' and 'With The Beatles PMC 1206 PARLOPHONE'. It really is INCREDIBLY rare to find ORIGINAL covers for acetates - and rarer still to find acetate covers in this condition!!!! DONT MISS OUT!!!! Also with this acetate & its acetate cover - I will supply an ORIGINAL Great conditioned 'With The Beatles' Mono 1st Press Cover (see pictures) - in case of course the winning bidder wants it for display purposes - or just as a great extra to make this MEGA RARE acetate even more 'complete'!!!! I have also provided a HIGH quality white poly lined 1960s sleeve in perfect condtion (see pictures) to protect the acetate fully!!!! DONT MISS THIS MASSIVE OPPORTUNITY!!!! HOW MANY PEOPLE CAN EVER CLAIM TO HAVE SEEN A BEATLES ACETATE - LET ALONE OWN ONE!!!! HERE IS A STUNNING CHANCE TO OWN A COMPLETE 'WITH THE BEATLES' LP ACETATE FROM 1968 IN STUNNING CONDITION!!!! I CANNOT OVERSATE THE AMAZING RARITY OF THIS ITEM!!!! DONT MISS OUT!!!! HAVE A LOOK AT MY PICTURES - I DO MY BEST TO SHOW THE RECORD FROM ALL ANGLES AND MAKE THE PICTURES AS CLEAR AS POSSIBLE - THERE IS NOTHING TO HIDE!!!! It really is a GREAT looking acetate and it is truly rare to find any copies of this RARE Beatles acetate!!!! THIS WILL SURELY BE YOUR ONLY CHANCE TO BUY AN ORIGINAL 1968 MONO ACETATE OF "WITH THE BEATLES" BY THE BEATLES, IN STUNNING CONDITION!!!! Dont forget to have a look at all my other auctions including many other VERY rare Beatles & Other LPs, and contact me with any queries you may have. P&P £3 in the UK, Overseas TBA. Paypal, Cash, Cheques, and Post Orders accepted. Overseas MUST use either Cash or Paypal. Thanks for looking. Cheers!!!! !